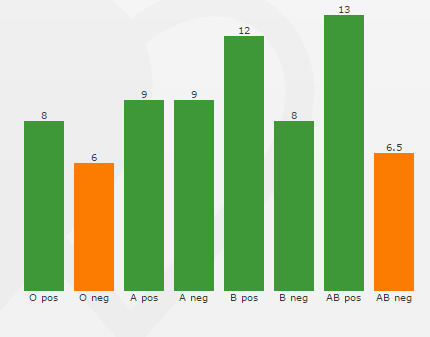 This is probably the first blog for some time that isn't football related in some way or another and is looking at the different ways the various parts of the UK show current blood stock levels - I was tempted to title it 'Getting blood from a (Steve) Stone', but felt that was a bit niche. In some respects Blood Donation follows a lot of the traditional methods associated with Charity activity (positive success stories, the emphasis on the difference you can make etc.,) but where for most charities the aim is getting someone to make a donation (or even better set up a direct debit), for blood donation the barrier is even higher as it involves the potential donor's time and effort as well as a certain amount of physical discomfort. The upside is where with some charities you may (probably falsely) wonder what difference your donation will make, by giving blood you can be sure that it really is something that is necessary to save lives. This blog compares how the 3 organisations in mainland UK display details of their current stock levels, and where what should be a fairly straightforward visualisation seems to get a bit of a mangling. Current Stock Levels: Not initially sure what figures relate to as next chart details number of days worth of stock. Also the use of 3 decimal places is odd (unless it is using the continental style of a full stop rather than a comma to mark '000s so the guess is there are around 11,000 units of O+ blood available). Also, not the worst crime in the world but 3D effect unnecessary as we'll see when looking at the Welsh version. Current Total Stock: These figures look like a sum of the current stock levels (the first chart above) for each individual day. Having the Y axis start at 22 highlights the relative drop in supply around Christmas and New Year. This could be argued as misleading but in this case it does help highlight the relative drop beyond the normal 'safe' levels of supply at that time of year. Days Supply remaining chart: Nice and simple, rounded to the nearest half day, colour coded and also displaying the figure. Green= Normal levels, Yellow: Amber warning (presumably under 7 days). Chart as at 21st April shows AB- as red with 3.5 days stock. 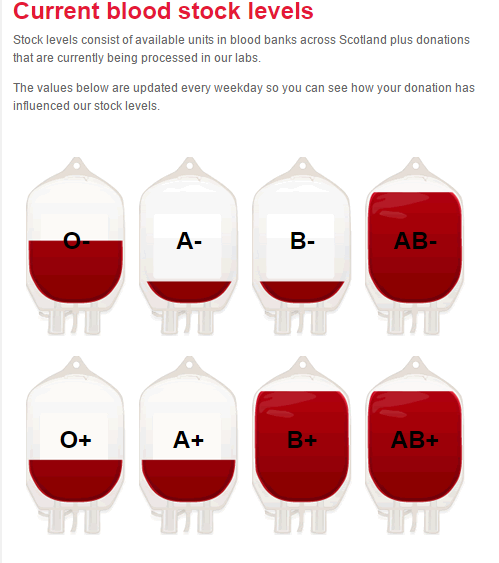 Scottish Blood Stock Levels: There are several issues with this way of representing the data - Actual figures are only available if you hover over (or click on) one of the images. Also the amount in the blood bag doesn't seem to obviously represent the amount available e.g., in the image above O- is 5.9 days and O+ 5.4 days. 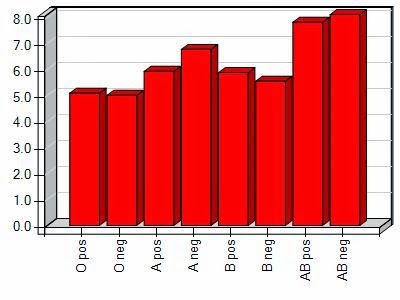 Also AB+ has significantly higher days supply than other groups but is at the same max level as B+ and AB+. 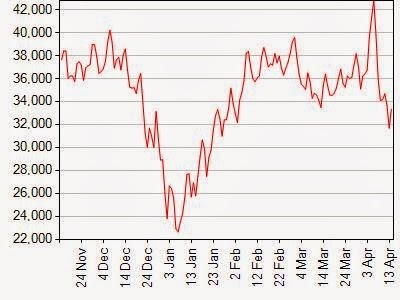 This however, like the Total Days Stock chart for England is where you might want to deliberately give a certain impression, if you as a potential AB+ donor know that they are currently extremely well stocked for this blood group, it could make you less likely to donate, even though that surplus level may only be temporary. Aside from the visualisations, it is also worth pointing out the issue of borders between the organisations, some people may be aware that there are now multiple bodies dealing with Blood donation but this was a surprise to me (I've never had to give much thought to the devolution of such processes) and something could be done on all the sites to direct someone to the correct area if they enter an address that is better suited to one of the other organisations especially from Blood.co.uk where it isn't obvious it is now only dealing with part of the UK e.g., you enter Newport (Gwent) on the site and currently get told that nearest location is in Somerset. 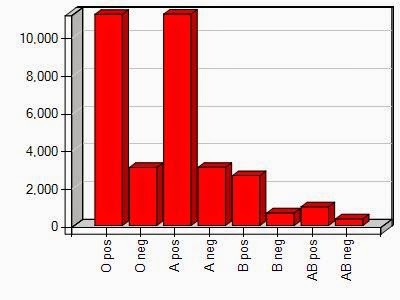 Overall, for me the image from the Welsh Blood Service is by far the best representation of the data, it gives the information clearly in a format that can be understood easily and colour coded to flag up particular Blood Groups with immediate problems.